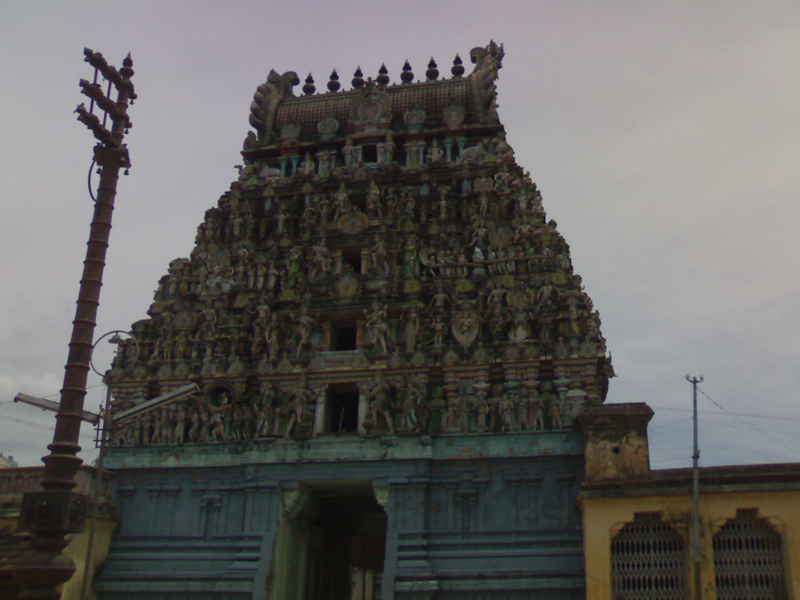 History:It is one of the 275 Paadal Petra Sthalams.This temple is particularly associated with Shiva saving his devotee Markendeya from death and the tale of saint Abirami Pattar,Subramanian the author of Abhirami Andhadhi then known as Abhirami Pattar was also a native of this place, a devotee of the presiding goddess. Sage Mrigandu and his wife Maruthuvathi were praying to Lord Shiva for child. The sage performed severe penance. Shiva appeared to Mrikandu and Marudmati.He told them that he heard their prayers and would give them a choice,they could either have a gifted son who would live to be only sixteen,or a son of low intelligence who would live a long life. 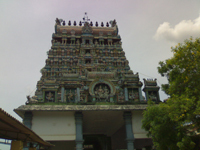 Mrikandu and Marudmati choose the former, Lord said that the sage couple would have a son with all wisdom and noble characters but his life would too short spanning just 16 years. He was named Markandeya. When he entered the age of 16, his parents were sad. Knowing the problem, Markandeya took a pilgrimage to all Shiva Sthalas. He came to Tirukadayur. This was the 108th temple of his pilgrimage. That also happened to his day of destiny. While he was praying to Lord, Yama directly came there to take his life. Seeing Yama, Markandeya embraced Lord Amirtha Kadeswara with all his might. When Yama threw his rope on Markandeya, it fell and covered Lord also, who in all fumes hit him and impair him with His trident. Angered by Yama's extraordinary arrogance, Lord Shiva kicked him and held him under his foot, making Yama inactive. Markandeya was blessed by Lord Shiva to remain sixteen years old eternally. It is for this reason that Lord Shiva is also called "Kala-samhara" (Sanskrit: "Destroyer of Time") at this temple. Turning to Markandeya, Lord said that he would ever be 16 only without death. Â As Yama was no more, there was no death in the earth. Mother Earth could not bear the amassed weight of beings living long without an end. She appealed to Lord Shiva telling her difficulty. Lord shed his anger and restored Yama to life in this sacred bhoomi. Lord is praised as Kala Samhara Murthy. His left leg is on Adishesha the divine serpent. He is holding His trident on Yama underneath. Nearby is Gundodhara dragging Yama with a rope. But Yama is not visible during darshan. During the puja time, when the peeta is opened, we can see Yama. The darshan of Lord with trident is called Samhara style and that with Yama is called Anugraha style. 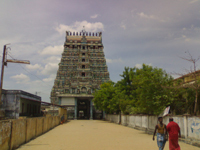 Devotees can worship Lord Amirthakadeswarar in both forms. 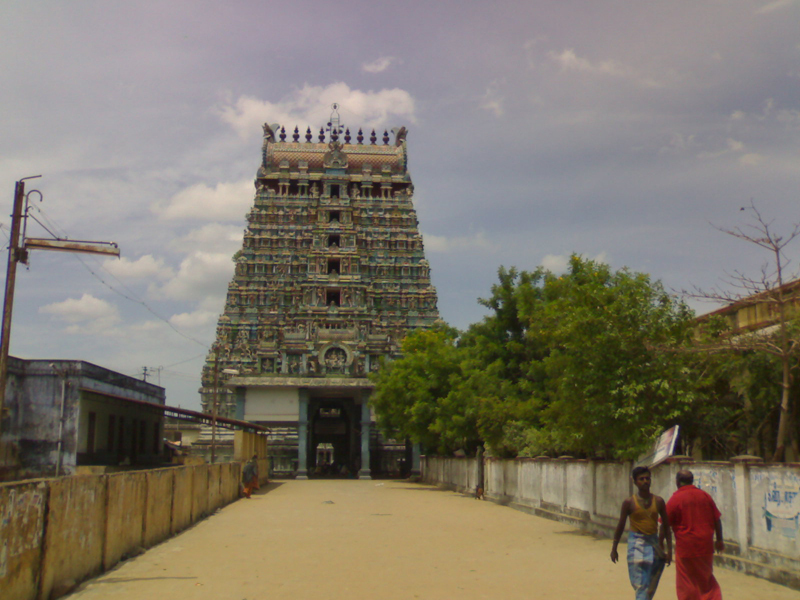 Mother Balambika as a little girl appears with two hands with Mothers Lakshmi and Saraswathi nearby.As the Akash Rahasya – sacred philosophy – in Chidambaram, there is a Yantra in the right wall of the shrine called Tirukadayur Rahasyam. Worshipping Lord Papa Kareswarar and the presiding Lord, people also worship this yantra for longevity.Yama appears in the shrine of Kalasamhara Murthy in a worshipping posture with his buffalo vahan nearby.The scar caused by the Yama’s rope is visible on the Linga only during abishek times. Travel Information:48km from kumbakonam.15 km north of Karaikal.